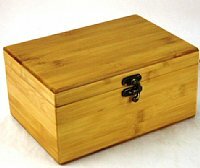 We've tried out many essential oil boxes in the past, and these are by far our favorite. These boxes are absolutely beautiful, well-constructed and finished. We had these made from specially treated bamboo, and we searched a long time before we found a manufacturer who could deliver on the quality and durability we wanted. These essential oil storage boxes have 24 compartments, a natural finish and a dark antiquey-style clasp. Our boxes are designed to hold 10ml (1/3oz) and 15ml (1/2oz) sized bottles. We've tested these out with the wider bottles (such as doTerra and Young Living) and our taller, slimmer bottles and both fit perfectly. The 10ml roll on bottles fit as well. The dividers are removable for maximum flexibility. Box Measures: 3.75" height by 8.5" length by 6" width. 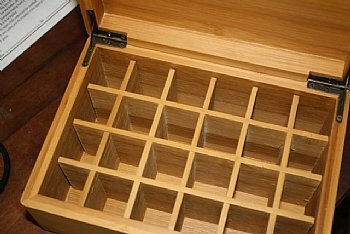 Inner compartments are 1" square and approx. 2 1/4" height. Review: This eo box is so beautiful. It's really well made and I love it so much I'm back to order another one to hold my growing collection of oils. Thank you! Review: You're probably thinking, it's a hinged box with divider slots, how different can it be from other less-expensive versions? First of all, it's made from bamboo, which is unusual, and the hardware is of very nice quality. I love it! Perfect size. Thank you. Also, really fast service & shipping. Review: Love that I can create my own business with these oils! They are wonderful and very effective. Frank and his crew are ready and available to help orders run smoothly. I appreciate this Company and excited to be purchasing from them! Review: I am loving my new oils. Great quality that I use at home and in my massage practice. Frank and his staff are always so nice. I have used other more expensive brands, and Dreaming Earth Botanicals are just as good if not better in quality and potency. Im excited that I found a local company that I can go to. Thank You.